We prune our young trees and shrubs to control their size, shape and scale within our landscape. Proper pruning also stimulates flowering and fruit bearing and helps to keep shrubs and trees healthy and vigorous, thus reducing the likelihood of future problems. Plants that produce fruit such as growing bananas need pruning to encourage growth and have a healthy fruit set. There are two main kinds of pruning cuts: Thinning and Heading. Thinning cuts reduce the size of a shrub or tree while stimulating little or no new growth. When you prune a smaller branch off a larger branch, you thin the tree’s structure without stimulating new shoots to form. When you cut a branch off just beyond a smaller branch that has at least 1/3 its diameter, the remaining smaller branch takes over and you don’t get a lot of vigorous new shoots sprouting below the cut. With careful thinning cuts, you can make a shrub or tree smaller without changing its shape. You also can use thinning cuts to change its shape or direction of growth if that is what you want. 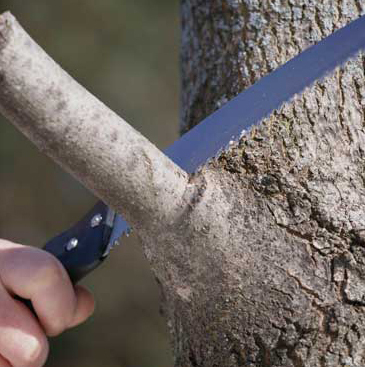 Use thinning cuts to remove crossed, dead or diseased branches, too. Use a sharp knife to do these cuts and prevent scars on the trunks at the ground level. Where a branch attaches to a larger branch or to the trunk, there is a slightly swollen ring called a branch collar. The branch collar is where branches fall off naturally when their time comes. The branch collar contains natural wound healing chemicals. Never cut the branch collar off! When we prune off a branch at the outer edge of its branch collar, the wound heals rapidly and without infection. There is no need for pruning sealers, tree wound dressings or other such chemicals. In fact, research has shown that these, usually petroleum-based, chemicals actually inhibit the tree’s natural wound healing process, and can trap moisture at the wound, encouraging rot. When you cut off a branch attached to a larger branch or to the trunk, the falling branch could tear a strip of bark off the larger branch or trunk, thus opening it to infection. If the branch to be removed is too large to hold in your hand, use three separate cuts to remove it: First, cut part way through from the underside to sever the bark. Next, cut beyond the first cut all the way through from the topside, leaving a stub. Finally, cut the stub off at the outer edge of the branch collar.Careful not to damage the branch collar because this will make it susceptible to disease. Heading cuts encourage a flush of new shoots to sprout just below the cut and can be useful for topiary and creating hedges with a dense cloak of foliage on the outer surface. When you cut a branch off anywhere other than just beyond another branch of at least 1/3 its diameter, numerous new shoots will develop below the cut. Normally, we use heading cuts to create formal hedges with shapes like boxes or spheres, and for whimsical topiary art. Certain trees that naturally produce few side branches also can benefit from a heading cut on the main stem which will encourage more branching.